But for the exact size for the canvas to be submitted, the Imago Mundi is a truly democratic platform for artists from all over the world to participate without restrictions. A catalogue for each country completed one at a time, it offers an incredible space where creative freedom is offered to all the artists to engage with as long as they are nationals of the selected country. When I was formally invited by the Benetton Foundation to curate the Libya catalogue, I knew it would be a huge challenge but one I was vey willing to take. My first big concern was how would I be able to find 140 Libyan artists within the time framework I was given. Secondly, how would I be able to convince each artist of the importance of such a project? And, lastly, my worry was about the logistics of how to physically provide the 10x12 cm canvas and package it to reach everyone, in a country that is currently stifled with conflict and a war situation and has little to zero postal services. ‘The Big L’ as I like to refer to Libya, is a land where art has been forgotten as a commodity and its production - although happening - is mostly unheard of by the rest of the world and little exposed to an international audience. Libya is a country that is so vast in its geography and has admittedly quite a complex social and ethnic make-up. Almost all of the land is covered by the Sahara yet it has one of the longest coasts of the Mediterranean Sea. With its multi-layered landscape its history has witnessed diverse civilisations residing in it and leaving their imprints. Beginning with prehistoric societies, this land has hosted the Phoenicians, the Greeks, the Romans, the Africans, the Amazigh, the Tuareg, the Tebus, the Arabs, the Ottomans, the Jews as well as modern traces from the West. Although considered by many to be a cultural desert, this is due mainly to its more recent political history that has played a major role in designating what is now available in terms of modern and contemporary art. Curating the Imago Mundi became a wonderful journey of discovery and a challenge for me personally, as Noon Arts is a small private foundation set up in 2012 after the 17 February Revolution and the fall of Gaddafi. 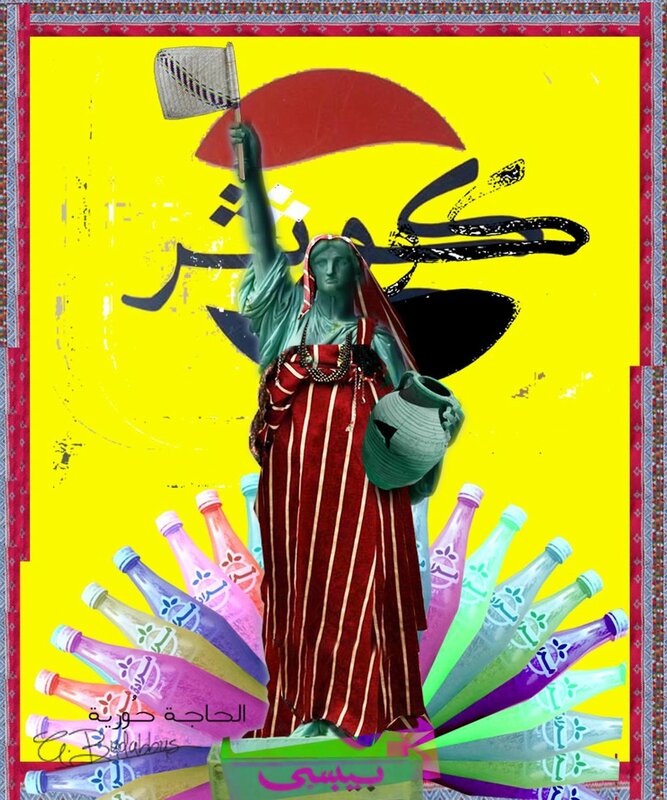 Its goal was - and still is - to promote contemporary art from Libyan artists and to expose the work to the rest of the world. Noon Arts has fortunately been successful in doing this by holding several exhibitions worldwide and allowing the artists their overdue international recognition and positive acknowledgement. The experience has unravelled the many threads of this unknown tapestry that makes Libya. Over the period of eight months, I have managed to approach a colourful palette of artists whose work reflects their dreams, worries and aspirations as well as their connection with this complex North African country. I want to firstly thank the Benetton Foundation for providing me with this incredible opportunity to provide an archive to future generations as documented in this moment in time, when the uncertainty of what is Libya could have prevented this from happening. In terms of the practical work to make the Libya catalogue a reality, I began by utilising the avenue of social media on Facebook to locate as many as possible Libyan artists. Then it became more of a reality on the ground when in Tripoli I liaised with The Art House under the supervision of Emad Pachagha; and, where in Benghazi, I located Abdelgader Bader. With the good work of these two dedicated individuals, we were able to reach 110 artists inside of Libya and convinced them to take part. The 30 others to complete the 140 figure were the Libyan artists living abroad in various Arab diasporas in different countries in Europe, Asia and the Americas. The journey has also involved in its different stages the input of other individuals. I would like to firstly thank the three passionate ladies whose research, editing, feedback and love for Libyan arts and culture played a major role in putting this finished product together. They are Nahla Al-Ageli, Hadia Gana and Hala Gellali. My special thanks also go to Ali Mustafa Ramada, Muftah Abudjaja, Farida Hajaji, Nadine Nasaret, Siraj Dugdug, Nouman El-Ageli, Eman Fezzani, Faisel Almeehoob and all of the artists that have now taken part. Lastly, a big thank you goes to the Benetton Foundation for approaching Noon Arts to undertake this very special assignment. I hope that this compact showcase will become a wonderful and useful reference point for future generations, offering as it does an open window looking onto the very rich, colourful and vibrant Libyan art scene, both for the Libyans themselves to see and for the rest of the world to appreciate.